Images, the band Lee Bartley co-founded with Rich Sallee, will perform a rare concert in southwest Colorado at the auditorium of Montezuma/Cortez High School. They recently sold out several concerts in Denver in 2011 and April of 2017. The band will consist of 2 saxophone/flute players, drums, guitar, bass, and piano. it will be all original music composed by members of the band, and mostly songs by Lee Bartley written for the band during their 16 years in Denver. The concert is the second concert in the SouthWest Colorado Concert Series for 2017-18. Since it is the “locals concert” for the season, all tickets will be offered at $10 each. It will be on November 19th (Sunday) at 3pm. Images, after reunion concerts in 2011 and April of 2017, has been invited back to perform a concert at the new Dazzle at 15th and Curtis. Parking is now easily available. The show times should be 6:30 pm and 9 pm on Saturday November 4th, 2017. For information contact: www.dazzlejazz.com. This concert will feature 2 saxophone/flute players, drums, bass, guitar, and piano. Joining Images this time around will be Steve Ivey on drums for part of the program. Lee Bartley has been asked to open the festivities on Saturday, May 28th, 2016 with a solo performance beginning at 10:30am at the Riverfest Festival in Farmington, New Mexico. Though the festival opens with a concert Friday night, all the vendors and artisans begin their part in the festival on Saturday. Lee Bartley will be performing at the Rocky Reach Terrace which is easily accessed from either side of the festival site. He will have all three of his solo piano CDs available for purchase and for autographs following his performance. Please join him for a late morning, peaceful beginning to what should be a great Riverfest 2016! Lee Bartley releases his 3rd solo piano CD! 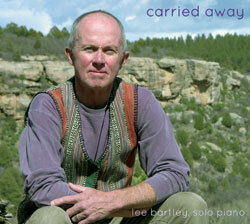 On June 8th, 2014, Lee debuted “Carried Away” his third solo CD in Mountainair, New Mexico. This CD consists of eleven compositions. It embodies a new concept for Lee in that four of the compositions were written with lyrics. Even though they are not sung by a vocalist on this recording, the lyrics are printed in the CD case allowing listeners to follow along as the melodies are played, giving the audience a refreshing way to envision a song. Listen to the tracks and purchase the CD directly from Lee here. St. Mark’s Fall Recital Series, September 19, 2014 at St Mark’s Episcopal Church, Durango, Colorado. Join us for a concert of Lee Bartley’s music, classical, classical art songs, light jazz and more. Performed by Lee Bartley and special guests. Further details will be posted soon. On January 26, 2014, at the Avenue of the Arts Hotel in Costa Mesa, California, I will be participating in a concert announcing the winner of the “Album of the Year” for the Whisperings Solo Piano Radio Network. I received this award in 2010 for my solo CD, “A View From Above.” The concert will consist, first, of past nominees and winners performing, followed by performances by the nominees for 2013. Details and ticket information can be obtained by visiting: SoloPianoAwards.com and the concert will be on Sunday, January 26th, at 3 pm. I encourage all lovers of solo piano music to attend and enjoy the festivities. On December 21st, 2013, I performed with Lisa Downing and Bob Baker, both from Denver, again at DazzleJazz. Both shows were to full houses and it was really nice to again perform in Denver’s premier live jazz club. This concert was videotaped and you should soon find posts on You Tube of the individual songs chosen by the performers. A highlight of this concert was welcoming a lifelong friend of mine, Don Graves, to the stage for one song where he played spoons and I played piano. Don (Harmon Graves) is the author of two books: When I was Three, and, Passionate Landscape: The Painting Journeys of Buffalo Kaplinsky. Also during this concert I featured three new compositions that will be a part of my upcoming third solo piano CD to be released hopefully by the summer of 2014.